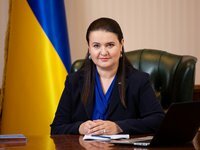 Ukraine's Finance Ministry is working on the implementation of the EU requirements to attract the second tranche of macrofinancial assistance from the EU in the amount of EUR 500 million by late March or early April, Finance Minister Oksana Markarova has said. "We are working on meeting the conditions. It is realistic [to attract the second tranche] at the end of March and the beginning of April," she told reporters at the Annual Ukraine Investor Conference organized by Dragon Capital in Kyiv on Tuesday. Markarova recalled that this is about the adoption of two bills related to customs reform. In addition, the finance minister said that the conditions for cooperation with the EU imply that there can be no less than three months between tranches of macrofinancial assistance. "Therefore, given that we received the previous tranche in December, this tranche, even if we do everything, we will not be able to receive earlier than March," she said. As reported, in September representatives of Ukraine and the European Union signed a memorandum of understanding and a loan agreement on the issue of the fourth EU macro-financial assistance program to Ukraine (MFA IV) for EUR 1 billion. The first tranche of EUR 500 million was sent to Ukraine by the European Commission in December 2018.